How much does it cost to travel to South Carolina? How much money will you need in South Carolina? $157 is the average daily price for traveling in South Carolina. The average price of food for one day is $37. The average price of a hotel for a couple is $139. Additional pricing is in the table below. These average travel prices have been collected from other travelers to help you plan your own travel budget. How expensive is South Carolina? The U.S. state of South Carolina is a part of the American Southrich in all the culture, cuisine, and countryside that make up the region. From the scenic Blue Ridge Mountains to a stunning coastline with many charming towns in between, the landscape of South Carolina is full of things to do and see. There are many great opportunities to dive into the past while indulging in the culture that thrives today. From bustling cities, historic landmarks, and cultural museums to backcountry mountains, sprawling beaches, and quaint low-country towns, South Carolina has a spread of sights laid abundantly across its diverse terrain. 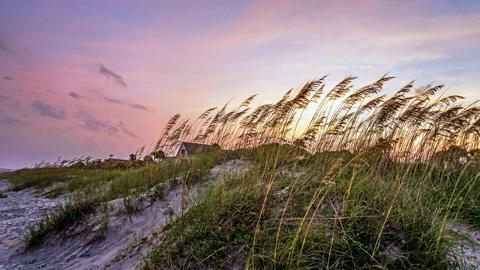 Myrtle Beach is one of the top destinations in the United States when it comes to pristine beach locations. Not only are there miles of sandy shores, but there is also plenty of opportunity for shopping, dining, entertainment, and outdoor water parks. Hilton Head Island also offers a beach experience, though more peaceful, away from the crowds attracted to Myrtle Beach. Charleston remains the historic port city of charm in South Carolina. With cobbled street and restored architecture, a few of its top sights include the historic district, Fort Sumter, the USS Yorktown, and the South Carolina Aquarium. Huntington Beach State Park with 300 bird species offers a naturalist's paradise along the coastline, while Caesars Head State Park offers another kind of utopia inland with trails, overlooks, and rivers amongst the mountains. And then there are South Carolina's beautiful plantations. While the state is home to more than 2,000 historic homes and stunning grounds, some of the best to tour are located in and around the Charleston area. The capital and largest city in South Carolina is Columbia. Located in the center of the state, it is home to The University of South Carolina, the Army's Fort Jackson, a zoo, and many museums that celebrate the art, culture, and history of the region. If you seek a metropolis lost to time, Charleston is perhaps South Carolina's best known historic port city. The oldest and second-largest city in the state, Charleston embodies that sense of southern charm and hospitality with beautifully restored homes and churches, cobblestone streets, hidden gardens, and a thriving culinary scene. Georgetown is another historic port, Hilton Head remains a top golfing destination, and Myrtle Beach boasts 60 miles of sandy beaches, resorts, historic landmarks, shopping, and entertainment. Other popular stops include Greenville, Florence, Beaufort, and others. Activities throughout the state range far and wide from outdoor adventures in the countryside, to exploring historic cities, beach fronting, and hopping museums across the capital. In Columbia, the Riverbanks Zoo and Botanical Gardens is home to over 2,000 animals, representing more than 350 species. From African lions to Siberian tigers, giraffes, zebras, and grizzly bears, the place is full of unique habitats that cater to each animal. Demonstrations are held daily, the botanical gardens cover a beautiful 70 acres, and there are even zip lines, a rock-climbing wall, carousel, and vertical ropes course for kids to find their inner monkeys. The South Carolina State Museum in Columbia is probably the best as far as museums go. The four-floor exhibit space features educational hands-on exhibits, a science theatre, a planetarium, and changing exhibits that highlight natural history, science and technology, art, and culture, as they relate to South Carolina. The Dupont Planetarium in Aiken is also a popular educational activity with both programs on astronomy and nature's other wonders. Swimming, water sports, lounging, and sunbathing are popular activities anywhere along the coast, especially on Myrtle Beachthough Hilton Head Island is a quieter, classier location for the same. And then there are the mountains. On the western side of the state, there is much opportunity for backpacking, camping, hiking, fishing, and wildlife watching amongst the trails of the Blue Ridge Mountains. There are many scenic overlooks and gorgeous views, plus prospects for geocaching, if treasure hunting is your thing. South Carolina, like most of the southern United States, is known for its home cooking, soul food, and barbeque. Most of the BBQ in South Carolina consists of tangy mustard-based sauces on pulled pork or chicken, and since BBQ is one of the staples it is the only state that boasts 4 distinct styles of sauces: mustard, vinegar, heavy tomato and light tomato. Along the coast, the cuisine is highly influenced by French and creole cooking with many fresh seafood options. Major cities, of course, will have just about any kind of international food you can think of, but low-country home-style comfort food remains the native favorite of the state. Sweet tea is also very popular and readily available just about anywhere, another main staple of the southern U.S.
South Carolina is serviced by several airports. The largest in the state is Charleston International, featuring flights all along the east coast. There are also decent sized airports in Myrtle Beach, Columbia, and Greenville as well as a few smaller regional airports in Florence and Hilton Head. By train, Amtrak has multiple routes that pass through the state. The Silver Service and Palmetto trains follow a route from New York City to Florida stopping in Florence, Columbia, Charleston, and a few smaller towns along the way. The Crescent Train takes its route from New York City to New Orleans and calls in Spartanburg, Greenville, and Clemson. By car, South Carolina is served by five interstate highways: I-85 in the northwest, I-26 in the southeast, I-20 near Columbia, I-95 along the east coast, and I-77 which comes in from Charlotte in North Carolina.